Deland, FL - It was recently reported that a dog owner used a weed whacker to stop a pit bull attacking his dog. Joshua Swanson told police that a pit bull suddenly appeared in his yard and ran through the open doors of his house and attacked his Labrador-mix. Swanson first beat the pit bull with a broom. When that failed, he started up his weed whacker and set it on the pit bull. He said the pit bull didn't even make a sound after being struck by the tool. "I first hit him on the back a couple of times and he didn't make a noise; he didn't even let go. Then I just jabbed him with it one last time..."
Swanson's girlfriend also threw a vacuum at the pit bull. According to police, the pit bull suffered large cuts to its back, right hip and hind leg and was taken to an animal clinic. Swanson's dog, named Lucy, sustained several puncture wounds to the hip area. When police located the owner of the pit bull the next day, Craig May said he thought someone had "stolen his pit bull." Apparently, the cage door was ripped open, the wires bent and the pit bull was gone! A subsequent article did not resolve the "stolen" claim or the ransacked pit bull cage. But May's mother, Emma, told reporters that the dog had been put to sleep. DogsBite.org has tracked numerous tools used to try to stop a pit bull assault. These items include, but are not limited to: handgun, shotgun, catch pole, knife, machete, sword, axe, screw driver, baseball bat, broom, shovel, rake, pitchfork, barbecue fork, pole, metal pipe, tire chain, hammer, crow bar, boiling water, umbrella, hockey stick, tree limb, wooden board, satellite dish, rock, flashlight, nail-gun and now a weed whacker. As Lockwood documented in his study, pit bulls are 14 times more likely to break containment and attack compared to other breeds. Of course the Pit Bull community knows this yet refuses to breed safer dogs. The circular saw attachment on a weed whacker seems to be more effective than a breakstick. And once again, thank you ZUPF! Emma May, what a hillbilly. I wish I could magically trade your place with the mother of another pit bull owner, Carloetta Benton. Emma and Carleoetta need to start up a support group so that they can grieve the loss properly. Mothers of Idiot Sons with Pitbulls. Got news for you, idiot Ms. May. They love their dog, too, and they had every right to stop that mauler from killing it. But please, keep flapping your yap. It’s people like you that bring breed bans closer to the national level every single day. I believe two construction workers used drills to stop the pit bull that was attacking Angela Silva in her garage. WE CAN’T EVEN BE SAFE IN OUR HOMES! These pit bulls are coming into our homes to kill. How much longer will we as a society put up with this? Did you see the ironic comment in the subsequent article? Sounds like some No Kill crazies have infiltrated animal control and are spending tax dollars warehousing fighting dogs before handing them out to kill. Sounds like they extorted some money to build a new building for it too. Sorry folks, just had to say that before some pit nutter does. Okay — this is ironic. 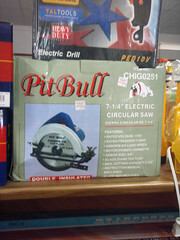 There is a Pit Bull Circular Saw on the market. b) was voted most likely to take off fingers and hands. As a public service announcement, the ABDA, UKC, AKC and Cesar Millan and others should demonstrate, for all of the American dog owning public (whose dogs are regularly, severely mauled by the am staffs/apbts, how to use a breakstick! Everybody has a broom and the broomstick could be used to pry the death grip of the pit bull.